Gentle hands, warm hearts, & experience you can trust for your dental care. Dr. Marc A. Johnson is one of the most well respected dentists in New York, not only by other dentists and dental specialists, but more importantly by the patients who have entrusted their care to him for over 20 years. His reputation for ‘doing things right’ and being the ‘go-to guy’ is a reflection of the passion and concern Dr. Johnson has for helping patients improve their dental health and appearance. As a dentist in Saratoga Springs, NY, he has created, restored and cared for some of the greatest and most notable smiles in the region. Early in his career, he was nominated by his fellow dentists as the region’s Young Dentist of the Year for New York State. 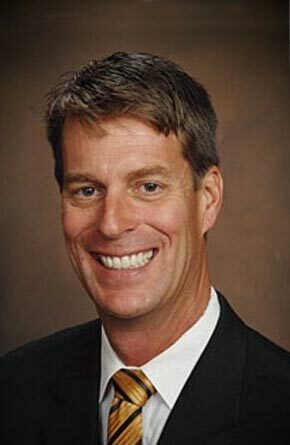 He has been one of the Consumer Research Council’s Top Dentists in America for years, and has been voted The Saratogian newspaper’s BEST of Saratoga Dentist, as well. Dr. Johnson wanted to be a dentist since he was a 10th grader in Hastings, MI, where he grew up. His younger years taught him the value of hard work, integrity and compassion for others. His drive to be the best enabled him to be one the few students admitted to the University of Michigan School of Dentistry after only three years and without first graduating with a Bachelor’s degree or Master’s degree. After successfully graduating on time, he passed all of his board exams and credentialing the first time – a remarkable achievement. Immediately after graduation in 1988, he married his hometown sweetheart and fellow Michigan grad, Angie, and they moved to New York to start their new life together. They chose this area because they believed it was the nicest place to live, serve, and raise their family. Dr Marc A. Johnson’s advanced dental education didn’t stop after dental school graduation. It was only the beginning of an exciting journey of advanced care training, credentials and dental knowledge to best help patients suffer less and smile more. Ultimately, he has earned his Fellowship in the Academy of General Dentistry (FAGD), an honor bestowed on fewer than 10% of dentists in the nation. He is a graduate of the Dawson Center for Advanced Dental Study and Bill Strupp’s Post-Graduate School of Dentistry. Much of his advanced cosmetics training came from the prestigious Las Vegas Institute of Cosmetic Dentistry program (LVI) and the University of Buffalo Advanced Aesthetics Continuum of hands-on and instructional course work. Exceptional customer service and team development were the result of Dental Boot Kamp, Master’s Boot Kamp, and In-office coaching. His implemented expertise in sedation dentistry was earned through the Dental Organization for Conscious Sedation (DOCS), where he completed continuums through Advanced Level Conscious Sedation. In 2011-2012, he graduated from the Dr. Garg’s Implant Seminars Continuum. Dr. Garg ‘wrote the book’ and has taught many dentists and dental specialists the skills to place implants in even the most challenging situations. In addition, he has attended hundreds of hours of other hands-on and lecture courses to train dentists to understand completely what it takes to help patients to smile again when they have been suffering from dental problems and too embarrassed to smile. He is also earned his fellowship in the Academy of General Dentistry. Currently, Dr. Johnson is seeking his fellowship in International Congress of Oral Implantology. Dr. Johnson’s professional memberships include the American Dental Association (ADA), American Academy of Cosmetic Dentistry (AACD), The International Congress of Oral Implantology (ICOI), American Dental Society of Anesthesiology (ADSA), the New York State Dental Society (NYSDS), Fourth District Dental Society, The Leading Physicians of the World, Consumers Reseach Council of America’s Top Dentists and The Crown Council. He has also been a member of the The American Dental Implant Association (ADIA), Dental Organization for Conscious Sedation (DOCS), American Academy of Cosmetic Dentistry (AACD), and Academy of General Dentistry (AGD). In 2006, Dr. Johnson passed his first practice on to his successor so that he and his wife could fulfill a lifelong dream to sail about the world as a family for five years. With their dream realized, Dr. Marc A. Johnson returned to the dental profession he loves. This fresh start has given him the opportunity to engineer and design a dream dental office that provides optimal comfort, care and dental technology. Most of all, Dr. Johnson just loves his patients. He provides ‘no pressure’ solutions for patients to have pain-free, problem-free Smiles for Life. His new office offers the most up-to-date dental health and prevention techniques, his special methods of complex reconstruction, dental implants, cosmetic dentistry, and oral conscious sedation are proven. His integrity and honesty are unwavering, earning him the respect and trust of so many. Dr. Johnson remains happily married to his high school sweetheart, Angie. They now have two teenagers, Parker and Sabrina, who Dr. Johnson thinks just might be future dentists in the making. The entire family loves to spend time in the great outdoors and traveling. Together they enjoy learning, skiing, dining, hiking, reading, and, of course, boating. Even the simplest pleasures, such as roasting marshmallows by a fire, can spark the interest of the Johnson family. Our team is very responsive. If we do not return your email immediately, please know that we may have not received it. For important matters, please call our office. If you prefer to share protected personal information, you may choose to contact us by phone. We are conveniently located on South Broadway (Route 9) next to Subway™ and across the street from the Saratoga National Bank & Trust.